VICTORIA, BC – Spinnakers Gastro Brewpub has announced the release of the 2015 edition of the annual winter seasonal Happy New Beer, although those who have tried it in past years will find it to be quite a different beer this time around. Originally a Belgian-style wheat beer, and then a Honey Kölsch, this year’s version of Happy New Beer is a 4.5% abv lager that was aged in French oak red wine barrels, soured, and dry-hopped with Pacific Northwest hops. 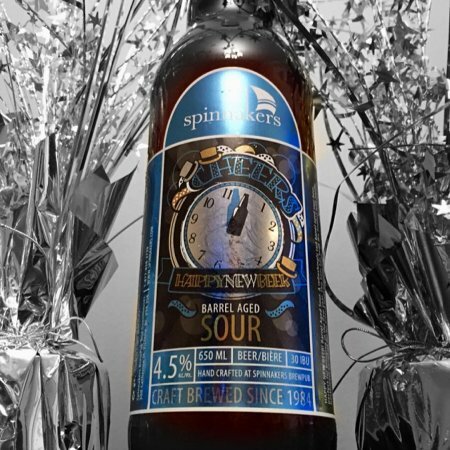 Happy New Beer Barrel Aged Sour is available now on tap at the Spinnakers Brewpub, and in 650 ml bottles at select private liquor stores in and around Victoria.